Before the First Tooth has developed a 20 minute virtual training to provide community organizations with important oral health information. Click on the picture below to begin the online training! Before the First Tooth has developed patient education materials to assist health professionals and community organizations in talking with patients about oral health. The “Dental Care During Pregnancy” bi-fold can be given to pregnant women to educate them on the changes they may see in their mouth and how to best care for teeth and gums during pregnancy. 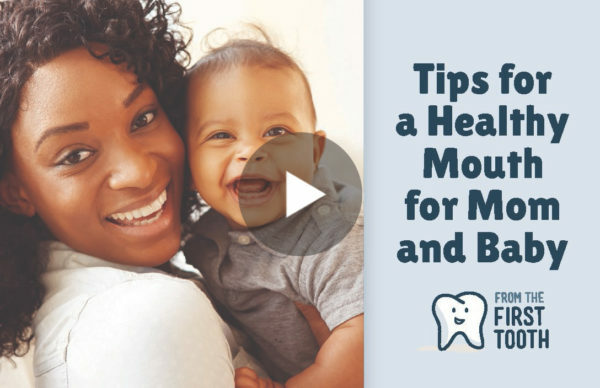 There is also information about caring for a baby’s mouth. The “Pregnancy and Dental Health” postcard is a short resource that tells pregnant women how to care for their oral health during pregnancy. The “Perinatal Oral Health Assessment” Checklist is used primarily by OB/GYNs and family medical providers while giving pregnant women an oral exam. Community organizations can also use this as reference when talking to their clients. The “Fluoride Varnish” rack card is given to parents and care givers to explain what fluoride varnish is, how and where a child can get it, and information about its safety. The “Healthy Smiles for Life” trifold is given to parents and caregivers to educate them on oral health care for their children from newborns to age six. It includes information about fluoride varnish application. FTFT is funded by the DentaQuest Foundation in all five states and in Maine by grants from the Sadie & Harry Davis Foundation, Northeast Delta Dental and the US Department of Health and Human Services, Health Resources and Services Administration.